A new Blood Bank of Alaska location celebrated its grand opening Thursday in Juneau. The region has been served by mobile blood donation drives in the past, but this is the first permanent facility in years. Donors can call or make an appointment online. I decided to stop by last week during the soft opening to donate a pint of blood. Even though I’d donated dozens of times before, I still had to look away when the needle went in. 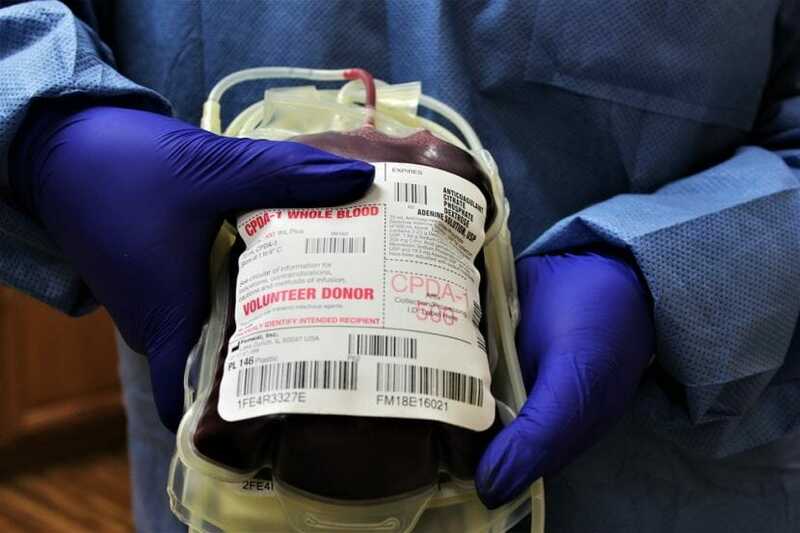 “I just don’t watch it,” said Wesley Dahlgren, director of collections and recruitment for the Blood Bank of Alaska. He was nice enough to sit down for an interview while I donated. Dahlgren is based in Anchorage but was in town for the soft opening last week to help get the new facility up and running. The Blood Bank of Alaska collects, processes and distributes blood throughout the state. They also have donation centers in Anchorage, Fairbanks and Wasilla. Bartlett Regional Hospital doesn’t have a contract with them, but a few other hospitals in Southeast do. I asked Dahlgren what would happen to my blood after we finished. He explained it would be sent back to Anchorage via Alaska Airlines. “It will get processed, and the components in your blood will basically be broken down. Then that blood will be shipped as needed throughout the state,” he said. It takes up to two days for blood to be screened before it can go out into the supply network. Once there, it has a shelf life of about 40 days. A donor can only give blood every two months. That’s why blood centers always need a fresh supply. I’m Type O-positive — the most common blood type. Even though Type O-negative is the universal donor, Dahlgren said Type O-positive is the most transfused type of blood. “It’s about 30 to 40 percent of the population, but only 38 percent of the population is eligible to donate. So we always need O-positive,” he said. Dahlgren said hospitals in remote towns like Bethel, Nome or Utqiaġvik keep a supply of Type O-negative on the shelf since they can’t store large quantities. But donation centers need donors of all other blood types, too. Dahlgren said only about 2 to 3 percent of Alaskans donate blood. That’s a lot less than the number of hospital patients who need it. After about seven minutes, the machine beeped like I’d just leveled up in an ’80s arcade game. That meant I was all done. A tech bandaged my arm and put my blood bag in a freezer. Dahlgren thanked me and invited me to stick around for a few minutes and have a snack. “You know, a lot’s changed in blood banking in the last few years, but cookies have not changed,” he said. The hours for the Juneau donation center in the Jordan Creek Center are currently Monday through Friday, 9 a.m. to 5 p.m.